By preserving sites that have been central to the black experience, Obama helped revitalize our civic religion. Among its other accomplishments, the presidency of Barack Obama—you do remember it?—featured an unmistakable expansion of public appreciation for African-American history. 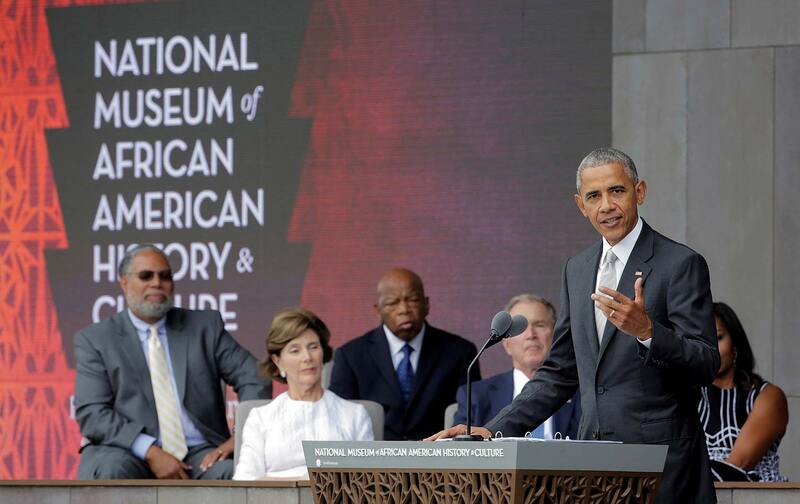 This was especially true as his time remaining in the White House dwindled away: From the opening of the Smithsonian’s Museum of African-American History and Culture to the designation of a site in South Carolina as the nation’s first national park devoted to Reconstruction, the Obama presidency ended with considerable emphasis on how the nation conceives of African-American history in public spaces. In many ways, and despite whatever uncertainties lie ahead, Obama’s attempts to memorialize more of the African-American experience enhanced the meaning of what it means to be an American. The idea that the United States has a “civil religion,” an argument first put forward by sociologist Robert Bellah in 1967, suggests that all Americans possess certain national touchstones for collective memory. We have a shared understanding of the importance of certain events, such as the battles of the American Revolution and the Civil War. This is crafted by public memory—history not necessarily as it is written by historians, but more generally, the ways in which the public remembers the past in popular culture and media. During Obama’s presidency, America’s civil religion expanded to include moments from the civil-rights struggle and other protest movements, all of which enhanced and enlarged the definition of who counts as an American. In a rapidly diversifying country, the importance of this achievement cannot be underestimated. From his early entry into public discourse, which can be traced to the publication of his memoir, Dreams From My Father, Obama has written and spoken extensively of the importance of African-American history—both to himself and to the nation. Indeed, Obama wrote in that book about the importance writers such as James Baldwin, Ralph Ellison, and Malcolm X had on the development of his own identity. As president, Obama continued his engagement with the black historical and literary tradition by using the power of the presidency to create landmarks to the African-American experience, thereby forever shaping public memory and America’s civic religion. His second inaugural address, in 2013, for example, argued for the need to memorialize moments in African-American history as part of a larger national narrative. His famous line about “Seneca Falls, and Selma, and Stonewall” was an attempt to broaden the idea of who is remembered in American memory. In both the realm of presidential rhetoric and physical spaces, Obama worked time and again to broaden the ideas of what is memorialized, of who counts as an American. Obama positioned the civil-rights movement within the highest pantheon of moments in America’s history. By comparing Selma to other important battles and turning-points in American history, Obama positioned the civil-rights movement within the highest pantheon of moments in America’s political and cultural history. Presidents, through public addresses and what they choose to memorialize, determine what future generations will also consider to be significant in the national story. Just as importantly, they choose the reasons why such moments deserve memorialization. This also matters. Think about President Ronald Reagan’s reluctance to support a holiday commemorating the birthday of Martin Luther King Jr. When Reagan was finally compelled to sign the bill into law in 1983—after pressure from both civil-rights activists and Congress—he repackaged King as a color-blind, centrist hero. Even though King’s birthday is now a federal holiday, Americans are still debating the legacy of Dr. King, thanks to Reagan’s attempt to appropriate him for the conservative cause. These were encouraging and affirming words not just for African Americans, but for those historians of the American experience who have argued over the last 50 years for a shift towards looking at the lives and aspirations of downtrodden Americans, and not just those “great men” in power. Obama’s own speeches and rhetorical gestures, therefore, speak to a larger shift in how American public memory is being recorded, stored, and used. Obama’s own speeches and rhetorical gestures speak to a shift in American public memory. Obama’s decision to grant national-monument status to a Reconstruction historic site in Beaufort, South Carolina, was another example of the president’s attempt to broaden what is memorialized in the United States. By establishing this national monument, the president corrected a previously grievous oversight by the national government—until then, there had been no national monument dedicated to the Reconstruction period. This is not a surprise. The Reconstruction era, long depicted through a racist and simplistic historical lens as a disaster in American history, has undergone a re-evaluation in the last fifty years among mainstream historians (and far longer on the left, going back to W.E.B. Du Bois’s Black Reconstruction, published in 1935). But for far too long, Americans appeared unwilling to commemorate Reconstruction as an important moment in American history. This was due to the era’s complicated racial and sectional politics, offering both an inspiring story of newly freed African Americans becoming citizens and the depressing end to that “experiment” only a decade after their freedom. Reconstruction has always resisted the easy American historical narrative of steady and inevitable progress. Along with providing for the creation of a Reconstruction historic site, Obama’s proclamation last month also designated historic sites for the Birmingham civil-rights campaign of the early 1960s, along with ones that tell the story of the Freedom Riders of 1961. Both these sites commemorate not just the victories of the civil-rights movement but some of the worst violence from that time period targeted against civil-rights activists. Again, Obama’s designations show that he is concerned not only with remembering American history as one of constant progress, but also one of struggle and—in the case of Reconstruction—with the potential for devastating reversals. Memory of the past matters. If Americans have a collective memory of the past that promotes activism and political participation, it has the potential to push modern and future activists to also imagine a better nation—just as freedmen and women did during Reconstruction, or activists in Selma and Birmingham a century later. The fight to reshape American memory of the past is one that must be joined by common citizens, politicians, and academics. The battle over the creation of a Reconstruction memorial site was led by historians themselves—most notably Greg Downs, Kate Masur, and Eric Foner. Local activists have often fought for new ways to commemorate civil-rights struggles. Everyone has a role to play in continuing Obama’s efforts to expand the public memory and revitalize the civic religion into one that represents all Americans. We need it now as much as ever. Robert GreeneRobert Greene is a PhD candidate in history at the University of South Carolina and has previously written for Jacobin, In These Times, and Dissent.